Viehofen in the Pinzgau is the perfect destination for a varied winter sports holiday. The proximity to the ski areas of Saalbach Hinterglemm Leogang, Zell am See and Kaprun glacier and the numerous recreational activities off the slopes will make your holiday in Viehofen an unforgettable experience.There is the proper equipment for any adventure in the snow at the ski rental ofi INTERSPORT Rent in Saalbach. 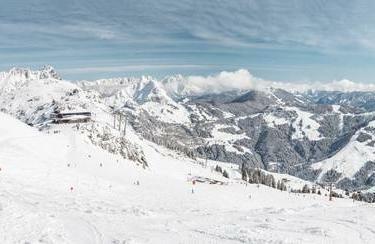 From Viehofen you can go by the free ski bus directly to the entry of the ski area of Saalbach Hinterglemm Leogang with its fantastic 200 kilometers of pistes in just five minutes. A perfect blend of blue, red and black runs to make the ski area a paradise for families, recreational skiers and professionals. The proper ski equipment for children and adults can also be found locally in Saalbach - hire skis and snowboards for your holiday in Viehofen at INTERSPORT Rent. Viehofen is not just a winter paradise for skiers and snowboarders, cross-country skiers, ski mountaineers, hikers and skaters will also find everything their heart desires. Top-groomed trails, fantastic ski routes to the surrounding mountains and an outdoor skating rink with floodlights provide variety. Visit us at the start of your holiday in Viehofen in one of our INTERSPORT Rent ski rental shops in Saalbach and learn about the diverse opportunities in the holiday region. The friendly staff will give you tips and advise you in choosing the proper winter sports equipment.